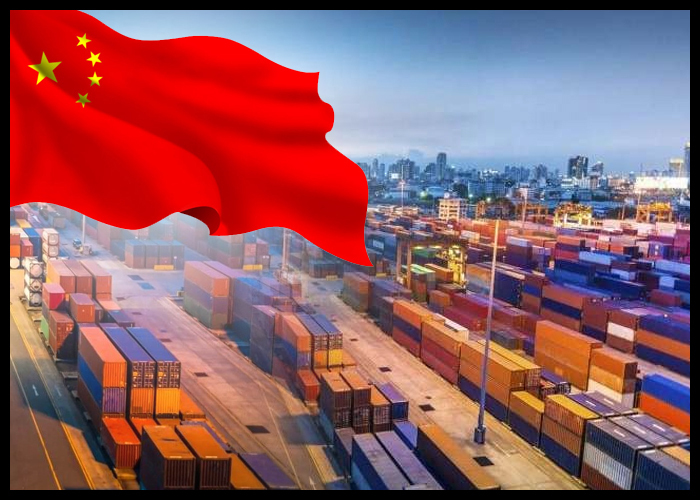 China on Thursday reported exports and imports for the month of October that exceeded forecasts, the country's General Administration of Customs reported. According to Reuters, China recorded a trade surplus of $31.78 billion with the U.S. in October — down from a record $34.13 billion in September. The country's cumulative trade surplus with the U.S. in the first 10 months of the year was $258.15 billion, Reuters reported. China's overall trade surplus was $34.01 billion for October, lower than the $35 billion economists had expected. Exports denominated in dollars rose 15.6 percent from a year ago in October, exceeding an expected 11 percent growth economists polled by Reuters had forecast. September exports grew 14.5 percent on-year. Dollar-denominated imports meanwhile rose 21.4 percent from a year ago, topping an expected 14 percent. September imports grew 14.3 percent on-year. Economic data from China is being closely watched amid a bitter trade dispute between the world's two largest economies, with U.S. President Donald Trump taking issue with his country's massive trade deficit against China. Despite escalating trade tensions with the U.S., Chinese data show the economy has largely held up so far. Many economists say the phenomenon is mostly due to exporters benefiting from increased orders before the tariffs hit, but the figures are likely to show stress in the months ahead. Chinese exports are also boosted by robust growth, both globally and in the U.S., said independent economist Andy Xie. Even with heavier U.S. tariffs on Chinese imports, a sharp decline in the Chinese yuan is offsetting most of the impact, Xie told CNBC on Thursday ahead of the trade data release. In fact, domestic factors due to the fallout from over-exuberant property market are the key reasons why China's growth would slow, Xie said. The trade dispute with the U.S. is thus a handy and timely excuse for Beijing to shift the blame of the economic slowdown from the property bubble — which would hit government land sales, infrastructure building, property sales and eventually, the macro-economy — to Washington, Xie said. "The government would say confidence is the issue and the trade war is the trigger, so that's why we should blame the trade war," Xie said. "It's an excuse to not do anything (to solve the problem, and) rather to frame this as part of the big trade war." Already, China reported slower-than-expected economic growth of 6.5 percent in the third quarter of the year — its weakest pace since the first quarter of 2009. The trade war with the U.S. is now complicating those efforts, with analysts expecting Beijing to boost policy easing measures to manage the threats from the bilateral dispute that may derail growth. Markets are now keeping their eyes on a much-touted meeting later this month between President Donald Trump and President Xi Jinping at the G-20 in Buenos Aires, Argentina.